I am a System Engineer specializing in cloud infrastructure design, virtualization and networking living in Germany near Hamburg. If your focus is on self-education and running a few VMs for various fun and education projects, this looks appealing. Perhaps you're trying to find a way to afford your own triple-node vSAN, then these little guys should do nicely for you as well, read onward for details. I freely admit, I have not tested a NUC first-hand, and am likely seen as rather biased given my extensive experience with the Supermicro lately, the only real server I currently own, on my multi-year power saving adventure. See also my full disclaimer below. Despite all that, I know this article will reveal at least some aspects of shopping for an efficient, quiet, and cool-running home lab that you may not have considered, especially if you're thinking of a cluster and/or vSAN. Yeah, I do enjoy researching the heck out of things before I lay down my hard-earned $, why not share my bookmarks. These are kits in the sense that you generally install your own memory and storage, then they're all ready to boot and use. I'm always interested in what's out there, and the creative cooling approaches folks come up with to work around the manufacturer's intended use case. Now let's talk about support, should you feel you might need some for your virtualization endeavors. The support of your peers is very important, and seems to be very strong for the beloved NUC, just Google search for NUC6i5SYH esxi 6. Known to be much tougher on flash storage, there's vSAN. Darn, now we're getting pretty pricey, with all sorts of enterprise-priced SSDs, PCIe SSDs, Ultra DIMMs, and NVMe SSDs. Yeah, it doesn't include consumer stuff like the widely-heralded Samsung 950 PRO, see also World's fastest consumer SSD - Samsung 950 PRO M.2 NVMe benchmark results. Consider also the Intel 750 Series PCIe NVMe, if sustained abuse from vSAN is planned and you'd start to worry about temperatures. But it's still a consumer product. See also VMware ESXi 6.0 Windows 10 VM speed comparison between Intel 750 Series NVMe SSD and Samsung 950 PRO M.2 NVMe SSD. Or step up all the way to enterprise-ready variants like the Intel SSD DC P3608 Series. Remember, you have two tiers to equip yourself with, see also schematic below. 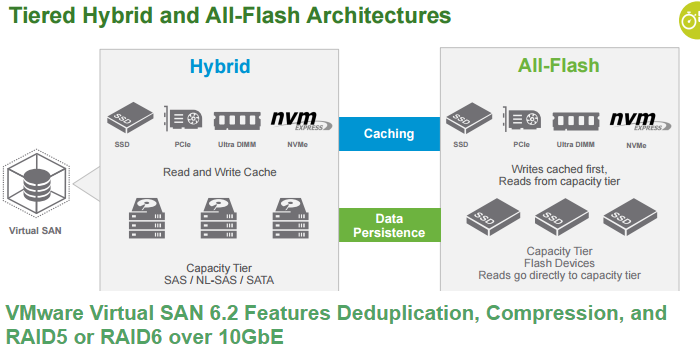 Whether you have spindles you want to add a flash caching layer to, or you plan to go all-in an All Flash vSAN 6.2. Both types are pictured below. Remember, you have two tiers to equip yourself with, whether you have spindles you want to add a flash caching layer to, or you go with All Flash vSAN 6.2, pictured below. I just don't have enough experience with vSAN yet to know much of anything for sure, including how to determine how well counting TBW (Terabytes Written) from within ESXi will work for consumer focused SSD. I also don't even own a 10GbE switch, see closely related discussion of this [H]ard|Forum thread. Instead of a three node cluster, what about two instead? 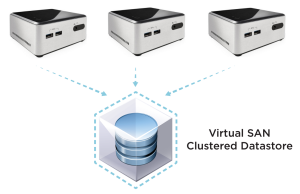 See [2 Node Virtual SAN (ROBO vSAN) Deployment](2 Node Virtual SAN (ROBO vSAN) Deployment). Maybe a SuperServer + Intel NUC combo starts to make some financial sense for just "kicking the tires" with vSAN, especially if the hefty performance compromise the 1GbE interface on the NUC is tolerable. "VMware vSAN on Intel NUC – Mobile Cluster for $2000"
There is no single correct or best solution for everybody. I realize this. This article just highlights a few approaches that might help you in your hardware research for gear that works well with VMware software. It’s rather early days for vSAN, especially at home, where it’s likely to be a pretty pricey proposition for a while yet, in hardware, and don't forget, in software/licensing, with EVALExperience helping out greatly. William Lam has jumped over from Apple Mac Mini to Intel NUC!